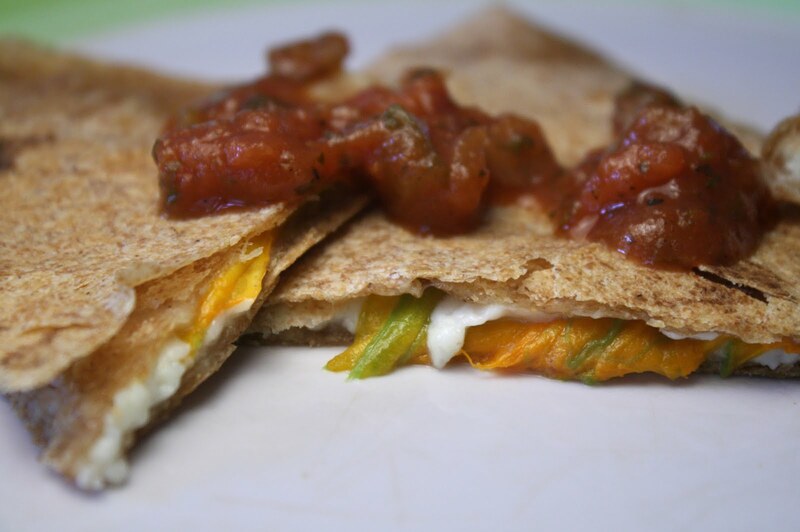 I've done a few quesadilla recipes before, but this may be the most tasty one yet! 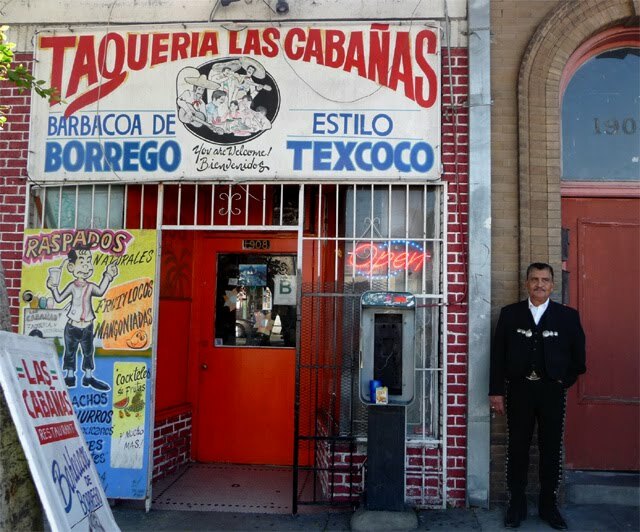 Just check out my exotic Cactus Quesadilla; or my wacky video of my neighbor, comedian Pedro Pe, cooking up his delicious Shrimp Quesadilla -- click on the dish name to see those recipes. 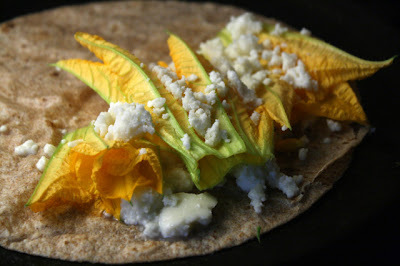 I first tried a Squash Blossom Quesadilla a couple years ago on the L.A.'s subway/light rail Gold Line's opening day celebration (video here.) My wife and I took it to Mariachi Plaza in Boyle Heights to a great hole-in-the-wall Taqueria. I immediately was curious when I spied a Squash Blossom Quesadilla on the menu -- into which the owner added fresh blossoms harvested from her own backyard. 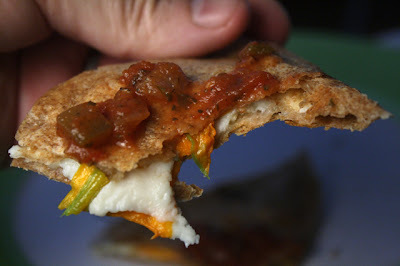 And I was not disappointed -- the quesadilla oozed melting cheese. And the strands of soft wilted blossoms gave the quesadilla a delicate, and mild, squash veggie flavor. I was impressed. 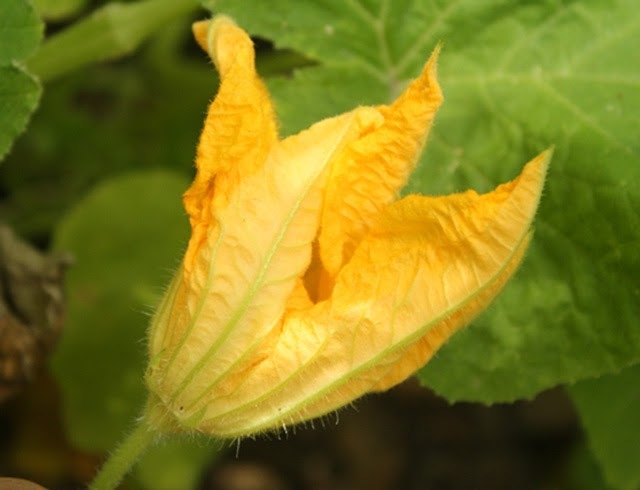 So this spring, when my compost heap became overrun by free squash plants with plenty of blossoms -- it was only a matter of time before I got down to making my own Squash Blossom Quesadilla, and share the colorful recipe with you. About 3 squash blossoms - depending on the size. 2 slices of your favorite cheese - I used a crumbly Queso Fresco. On a grill or pan, over a medium head, add the tortilla. Add sliced or crumbled cheese and squash blossoms. 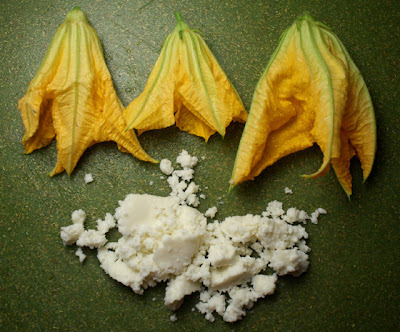 If you are using sliced cheese put squash blossoms between 2 slices. Fold tortilla in half. 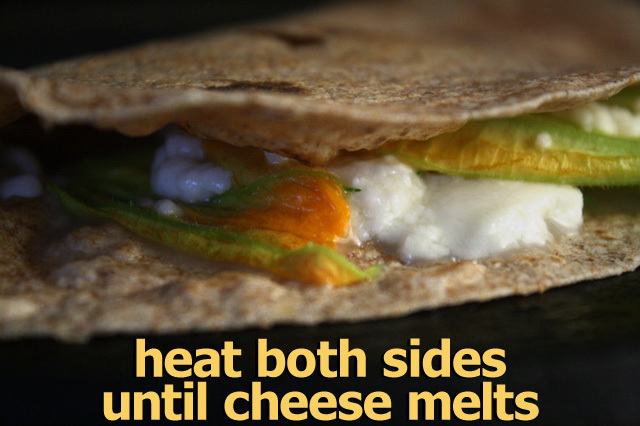 Cook one side until lightly browned or cheese is melting, about 4 minutes, depending on the heat. Turn over stuffed tortilla and lightly brown the other side, another couple of minutes.The plump squash blossoms will wilt and shrivel, but intensify in flavor. Slice in half and serve with a favorite salsa. If you are serving them at a party, then you can slice into 3 or 4 bite-sized triangle pieces, and pass around a platter full!